I’ll describe an if bet win only in detail. You’ll learn how it works, pros and cons, tips and bets to try yourself. Share our neat infographic with your buddies, you’ll impress them and could win a few bucks! An If Bet Win Only allows a player with limited bankroll to make a sequence of bets at once, moving to the next bet if the previous one wins. If Bets are great alternatives to parlays. Player combines multiple bets into simple If-then sequence. Next bet sees action if previous wins. Up to 7 bets can be combined. Single Action. Subsequent bets cannot be more than previous bet’s risk + win. Player combines 2 bets taking favorite Oakland Raiders -7-110 vs New York Giants and underdog Miami Dolphins +3-110 vs Houston Texans. Player risks $220 to win $200 on favorite Raiders. IF Raiders win, THEN player takes underdog Dolphins. Maximum second bet is $420. $220 risk + $200 won from Raiders game. Player risks $330 to win $300 on Dolphins. Total potential win $200 + $300 = $500. Note: Risk any amount on second leg. A second $220 bet would win $400 if both bets win. Or a loss of $20 ($200-$220 = -$20) if first bet wins and second loses. Bettor still loses -$220 if first bet loses. Good for small bankrolls or all money in play. Good if you have less confidence in second bet. Make two bets when you only have money for one. Reduces number of bets a losing bettor can make at once. Good if you can’t make a second wager later. Set it and forget it. Bad for winning bettors. Separate straight bets more profitable. Winning bettor should make as many wagers as possible. Winning payout can be lower than a successful parlay. 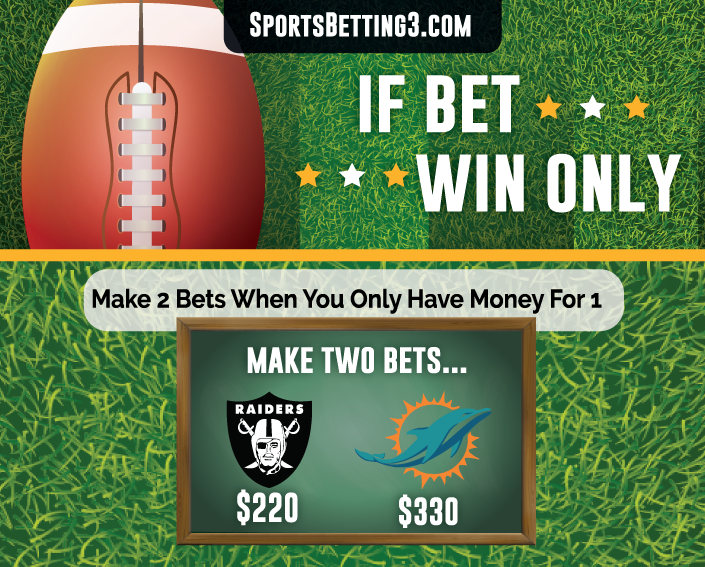 If first bet is lost, bettor could still bet the second game. Doesn’t manage risky behavior. Less common – Some books limit size of subsequent bets to less than previous risk + winnings. Use for small bankroll management. Use when more confident in first play than second. Don’t use if you can win more than 52.5% of games. Straight bets are more profitable. No “luck” required to win first game. Stay disciplined. If your first bet loses, don’t make a straight bet on second game. Advanced Bettors – Use parlays if your win percentage is below 72% when making codependent wagers. Example: IF Favorite THEN over low game total. Use If/Reverses if percentage is better than 72%. Now and Later. If the Favorite wins the afternoon game, THEN the Underdog in the night game. Underdog and Under. If the Underdog Wins ATS, THEN bet Under the Total. Also called a codependent wager. March Madness If Bet. IF Team One wins, THEN team two. IF Team Two wins, THEN Team Three, etc. Cheap way to play multiple teams in one round. Assumes player is doubtful and has little money to risk. Super Bowl If Bet. IF Favorite wins ATS, THEN Over the Total. Same City, Different Sports. IF New York Giants -7, THEN New York Knicks +18. Assumes player is doubtful and has little money to risk. If Bet was invented by Brad McFarlane. McFarlane is thought to be the VIP Host and betting consultant at Bookmaker.eu sportsbook. McFarlane created the concept from his “loathing of cleaning crews and a bit of luck”.